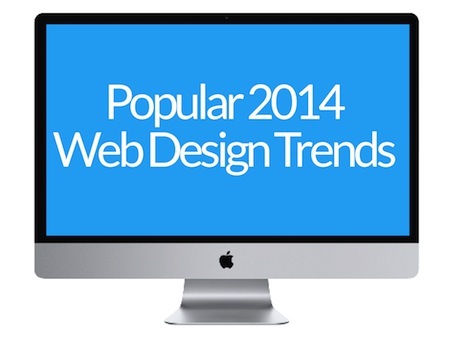 Home > Blog > Creative Design > What Website Design Trends are Proving Popular in 2014? There’s always an exciting time at the start of the new year when everybody in the web design industry starts speculating about the trends that are going to take hold in the coming months… We’re now halfway through 2014, with this awesome sunny spell marking the longest day of the year, and with the industry continuing to grow and diversify at a pace we’re seeing all kinds of changes taking place. With that in mind, what website trends are proving popular in 2014? Here are some of the contenders. To say that innovative typography is a 2014 web design trend would be an unhelpfully simplistic statement; the fonts and typefaces that designers use are constantly changing. Typography is an artform that has been used for thousands of years in the pursuit for visually-pleasing forms of text. However, we’re seeing a diversification and boldness that marks a clear distinction from the last couple of years. Big, bold choices of typeface are allowing designers to make strong statements that capture the imagination of the reader and strengthen the brand that they represent. If you want to make a powerful typographic statement then finding unique, distinctive fonts is a great way to impress website visitors and communicate in an innovative and powerful way. A couple of years ago corporate website design had settled into a fairly consistent form. A homepage would typically feature a central slider with 3-4 images linking through to relevant pages of content. There would be a menu across the top of the page and scrolling down through the site would reveal the company’s latest news, projects and portfolio items. There are various reasons why this became common parlance for business websites. The use of sliders allowed various competing items to be displayed simultaneously, with the homepage issuing a breadth of messages and ideas that would resonate with different kinds of visitor. In 2014, however, we’ve adopted a very different philosophy in terms of homepage design. We’re seeing a greater emphasis on creating a clear, strong first-impression by simplifying the message and clarifying exactly what the brand offers. Web designers are encouraging their clients to focus visitors’ attention with a large introduction, bold visuals and a clear vision statement that compels the user to explore further. This allows for easier integration with responsive website design, encouraging greater compatibility and functionality for mobile users. Image-sharing sites like Instagram have given us all the ability to manipulate and share our images using a range of filters and effects. There is an argument that this is changing the way that we perceive imagery, resulting in designers choosing bolder, edited photos that are a central component the website design. There are various ways to use this kind of imagery, whether by applying filters, commissioning higher-quality images or simply by placing a blurred image behind branding, typography and text.